"But Layton would immensely help the new party with good numbers in Ontario and a remarkable showing in Quebec, pushing the Bloc to second place for the first time in years. Of course, I should caution those numbers don't factor in the thousands of Liberals who would be unable to vote, due to their heads having exploded." My blogging colleague, Jeff Jedras of 'A BCer In Toronto', is likely pretty accurate in the above noted statement. Yes indeed, a number of Liberals simply can not contemplate a Liberal / New Democrat coalition, even more so with Jack Layton at the helm. Regardless of what the poll numbers tell them, the Right Wing faction of the Liberal Party of Canada would rather see $tephen Harper remain Prime Minister. It's time that more progressive and pragmatic factions within the Liberal Party of Canada speak out. Why do you let the more aggressive 'Righties' in your party always lead the parade? It's no wonder that the once mighty LPC is stuck in a quagmire of its own making. More proof that there is NO such a thing as a 'Fiscal Conservative'! More people die each day as the government of President Felipe Calderon uses the Mexican army and the federal police to try to get the illegal drug industry under control. Calderon was elected by a razor-thin margin and followed the custom of Mexican presidents by immediately making a show of force. But he badly underestimated the power of the drug industry. The profits are estimated by many analysts to be between $30 billion and $50 billion a year, although it's notoriously difficult to track. But it is not a piddling sum in a country where oil is the official highest earner of foreign currency and supplies 40 percent of the federal budget. But the oil is running out. Calderon has publicly stated that the oil fields will be gone in 10 years or less." "The struggle for public security is a battle that will take time, that will take money, and unfortunately, it will also require human lives, but it is a battle that must be undertaken … We, the people of Mexico, together, are going to win." Mexico has seen an explosion of drug-related slayings in recent years stemming from Calderon's attempted crackdown on drug cartels, as well as rampant corruption within the country's police forces. 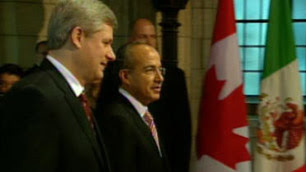 Prime Minister Stephen Harper, in turn, praised Calderon's "remarkable courage" in fighting drug cartels. The two leaders announced the signing of bilateral air service and youth mobility agreements, as well as additional funding from Canada to support Calderon's efforts to reform Mexico's justice system and combat the drug trade." Why Is Harper Providing 'Corporate Welfare' To Oil and Gas Companies? We used to call it 'corporate welfare'. Stephen Harper and his Conservatives call it a 'subsidy'. It seems to me that the bottom line for most Canadian oil and gas companies is healthy enough to do without tax dollars from 'Joe & Mary Average'. Conservative political dishonesty shines through on this story. Harper refuses to comment on it ... and Finance Minister Flaherty has put duct tape across his lips when it comes to comment. "Prime Minister Stephen Harper's government sidestepped questions Wednesday about whether it will cancel specific incentives and subsidies that favour oil and gas companies as part of a commitment on the agenda at next month's G-20 economic summit in Toronto. Although a leaked internal memorandum from the Finance Department obtained by Canwest News Service has recommended a list of programs that the government should eliminate in order to show leadership and honour a G-20 commitment made last year, Harper dismissed criticism from Liberal Leader Michael Ignatieff and NDP Leader Jack Layton that he ignored the advice. 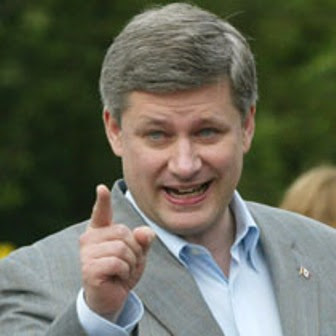 "Canada is a world leader in the elimination of these subsidies," Harper said in the House of Commons. "Compared to other countries, we have virtually none. I am not sure what specific subsidies the leader of the NDP is talking about." The memorandum, prepared for Finance Minister Jim Flaherty and marked "secret," outlined two existing tax incentive measures for exploration and development (the Canadian exploration expense and the Canadian development expense), as well as a sanctioned tax shelter (flow-through shares), as possible candidates to be eliminated by the government in order to honour the commitment made at a G-20 summit last year." 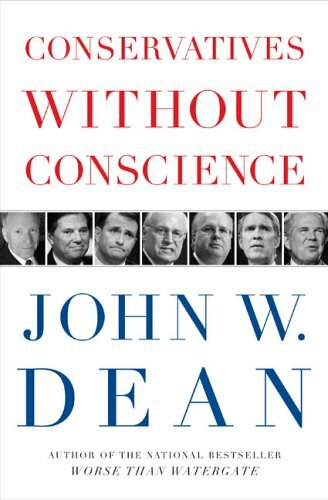 “Conservatives Without Conscience” by John W. Dean is a worthy read for all progressive thinkers. 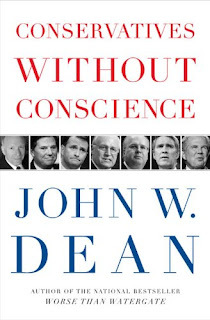 John W. Dean was White House legal counsel for President Richard Nixon for three years but become a key witness for the prosecution in the Watergate trials. He is a self admitted ‘conservative’. However, he was NOT a Bush supporter, His book, published 4 years ago, provides urgent warnings concerning the political mind set and aggressive behavior of the Right-wing in North America. This is not a post about Elizabeth May. It's about the 3-day weekend that Canadians are enjoying right now. When I was growing up, it was called 'Victoria Day' in honour of long dead Queen Victoria who ruled Britain from 1837 to 1901. A few decades later, almost no one (thankfully) calls it the 'Victoria Day weekend' any longer. Why should Canadians want to celebrate the reign of an ultra prudish English Queen who died 100 years ago? To fill the void of relevance, a new generation of Canadians has labeled this weekend as 'May Long.' Oh yeah! There's a name that inspires a mood of celebration and festivity throughout the nation! I have been critical of Canada's ongoing constitutional attachment to Elizabeth II, the current English Queen that we simply can't seem to ditch. Surely, Lizzy's great great grandmother Victoria inspires us even less. So in all fairness to Canadians, and ignoring the bleating of dinosauric Canadian monarchist voices ... the 3-day weekend in May needs a new, updated and more relevant designation. I guess 'May Long' will have to do for now, but I like it about as much as I liked it when it was called 'Victoria Day'. Have a nice weekend! tag: Queen Victoria - not dead enough! No matter where you reside on the political spectrum, from the far Right to the far Left, there can be no acceptance of violence in political discourse. None whatsoever. Period. The Question Is 'Why Were We Paying For Stephen Harper's Hair In The First Place'? Just about every group that has a bone to pick with Premier Brad Wall turned up in front of the Saskatchewan Legislative Assembly Building in Regina yesterday. -First Nations are angry at that fact that millions of acres of protected Crown Lands are going to be sold to the friends of Mr. Wall's Saskatchewan Party without any consultations with First Nations. Saskatchewan's First Nations are still seeking historical land settlements for land taken from them early in the 20th century. -Health workers are angry because they have gone three years without a collective bargaining agreement and the Wall government is in no rush to settle the matter. -Unionized construction workers are angry at Bill 80 which is Wall's attempt at 'union busting'. -Supporters of SCN (Saskatchewan Communications Network) are angry an the Wall government for killing this internationally renowned organization. A host of other demonstrators attended as well. The federal Conservatives just will not relent from trying to kill the Canadian Wheat Board. Since they came to power in February, 2006, they have tried one trick after another to hobble, cripple, neuter or destroy the Canadian Wheat Board. The good news is that they have not been very successful in their endeavours to date, especially with only minority status in parliament. Here they go .... again! Premier Brad Wall "We're just getting started" YIKES!! 1) The Saskatchewan Party are, without doubt, Stephen Harper's biggest supporters. 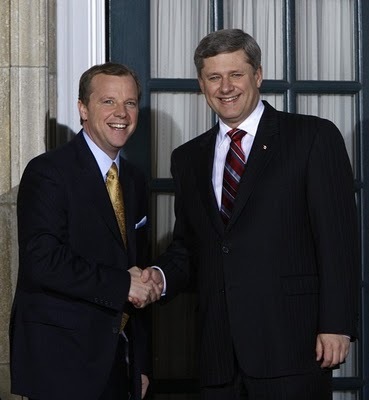 When it comes to the topic of Harper, Brad Wall simply gushes. The funny thing is that Saskatchewan has NOT benefited one iota from the Harper/Wall 'love in' . If anything, the Province of Saskatchewan is poorer for the relationship. "Because the government uses inappropriate accounting policies, the GRF (General Revenue Fund) financial statements (for 2008-09) report net debt and annual surplus inaccurately. 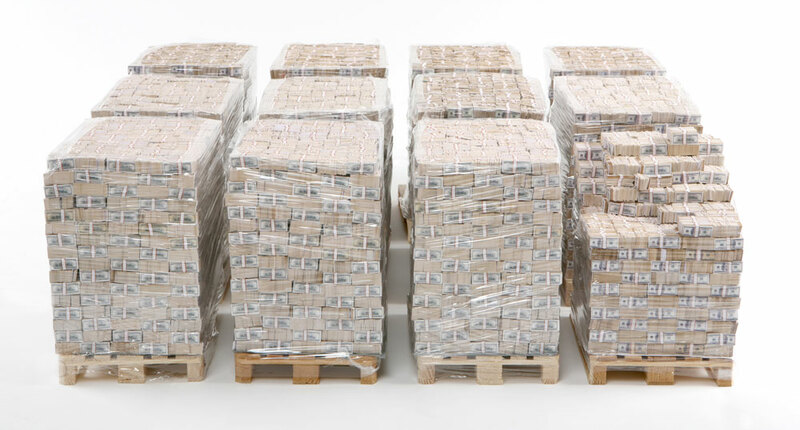 If the government had accounted for all transactions properly, the statements would have recorded net debt of $8.07 billion instead of $3.85 billion on March 31, 2009, and recorded a surplus of $1.62 billion instead of $2.39 billion for the year ended March 31, 2009." "I find these statements extremely troubling since no such undertakings have occurred. There has been no attempt by your Ministry to enter into a consultation process with First Nations people regarding the expansion of the sale of Crown lands protected under The Wildlife Habitat Protection Act." When Brad Wall tells you that he is just getting started, Saskatchewan people should be nervous as hell! British General Middleton was very cautious after his defeat by Metis troops at the Battle of Fish Creek (in what is now Saskatchewan). Middleton stopped all military action for two weeks in order to rest his men. The final major battle of the Northwest Rebellion took place from May 9th to 12th, 1885 at Batoche. The Métis forces had dug in and trenches stretched around the perimeter of Batoche. General Middleton decided to attack the town of Batoche from two sides at the same time. He planned to have a boat sent down the river to Batoche where it would attack from the west. Meanwhile, Middleton would lead his soldiers in an attack from the east. The steamer "Northcote" was prepared for battle by changing it into a gunboat. To provide protection from the Métis gunfire, the army used boards from Dumont's house and barn, part of Dumont's pool table and some food sacks. Dumont's house was then looted and burned. Thirty-five soldiers took up positions on th the gunboat, and it started down the river towards Batoche. As the gunboat reached Batoche, many of the Métis and Indians left their rifle pits and ran to the riverbank. There was an exchange of fire. 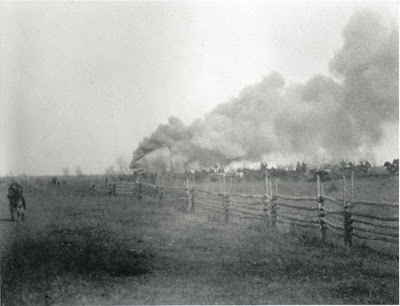 As the boat passed Batoche, the Métis lowered a ferry cable they had strung across the river causing the smokestacks, spars, and steam whistle to be knocked over. The gunboat drifted out of control, on down the river. It did not return. This was Canada's first and only inland Naval war in her history. Middleton and his soldiers marched towards Batoche. They arrived an hour late, so the gunboat had already passed and the Métis and Indians were back in their rifle pits. Middleton had field guns and fired at the village of Batoche. The women and children fled in terror. Middleton began to attack with his soldiers. But the Métis men were fairly safe in their rifle pits which had been carefully hidden in the bushes. Once again, Middleton's soldiers fought from higher ground where they were easy targets. At the end of the first day of fighting, Middleton believed he was losing. The next morning, Middleton decided to delay a major attack. His men needed a rest, and he hoped that the Métis defense would weaken with time. For the next two days, Middleton made use of his field guns and the gatling gun, but he avoided a major attack. The Métis continued to use up their ammunition. By the morning of the fourth day, some of the Métis had realized that the battle was hopeless, so they left. Many of the Métis that remained were old men. They were running out of bullets. Some were firing stones from their shotguns. As the armies fought in the distance, a group of Métis in the town asked Riel to work a miracle. Middleton's army became over anxious and while Middleton was indisposed, they began a frontal attack. The attack was poorly organized and allowed many of the Métis to escape to the safety of the bushes. Riel and Dumont fled as well. For three days the Métis defenders battled innumerable odds and superior weaponry. With ammunition running out, the defenders had to resort to using nails and other metal fragments in place of bullets. Badly outnumbered, the Métis were driven from their trenches and forced to surrender on May 12, the fourth day of the battle. 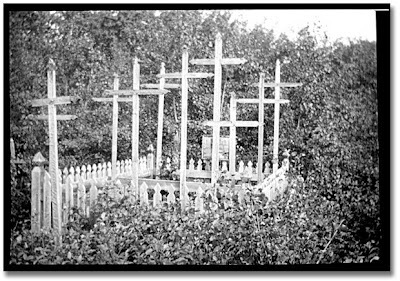 With the May 12 defeat of the Métis, Batoche was lost, families were scattered and the people lived in fear for themselves or their relatives who might be wounded and prosecuted(as had occurred 15 years earlier when the Red River Resistance came to its conclusion). Suddenly Batoche, the last great vestige of Métis dominion and the old way of life on the Western Plains caved in to military control. One by one, women and men began to turn themselves in to General Middleton's forces. In the process their weapons were confiscated despite protests that it would leave them without a means to hunt for food. As in past battles "To the victor go the spoils". Batoche was no exception. With the disappearance or imprisonment of the Métis; their cabins, farmlands, and possessions were ripe for the taking. Neither Middleton or the clergy were above reproach as they too participated in the looting. The impact and influence of the clergy in the community quickly vanished. During the battle the priests had attempted to talk the Métis out of fighting for what they believed in were their rights. When the Métis would not do what the Clergy wanted, the clergy acted as informants and passed on vital information gathered by the English Métis (in particular Charles Nolin) to the military. The priests also tried to blackmail the people by refusing to adminster the sacraments (holy communion) to those taking up arms and following Riel. Accidently, they denounced Riel as a heretic and when it came time to give up, they too collected Métis weapons as if they themselves were the military. With little faith left in the community for the church, members of the clergy such as Fathers Fourmond and Vegreville were finished. The parish at St. Louis was abandoned, and Fourmond hightailed it to Prince Albert. The ones who truly suffered, though, were the Métis. The human misery and suffering created by the conflicts along the valley of the South Saskatchewan was staggering. Families lost track fo their children. Many women, left behind when their men went to support Riel and Dumont, were without food, shelter or adequate clothing. They dared not return to their homes as those were being ransacked by soldiers; who, they thought, might imprison them as well as their men folk. Many had fled to the security of the woods and the caves that the women of the Métis Nation created a flag (the original Métis flag) in support of the battle. One of the familes Dumont assisted was Louis Riel's. Nobody knew where Riel was. For three days Dumont looked high and low for Riel. Finally thinking that Riel may have already turned himself in, Dumont took Riel's wife, Marguerite, and her two children to his father's home, Isidore Dumont. Isidore advised Gabriel to abandon his fight, to cease his hunt for Riel and to strike out for Montana where it was safe. He had no choice. Leaving behind his wife, Dumont bid farewell to his family and rode south with Michael Dumas. About a year after reaching the safety of the United States, Dumont joined Buffalo Bill's Wild West Show. After that, thousands of people paid to see Dumont demonstrate his riding and shooting talents. In 1886, the Canadian Government declared a general amnesty. Eight years after the fighting, Dumont returned home where he spent his remaining years hunting and farming. Gabriel Dumont died in Saskatchewan on May 19, 1906. The two leaders reacted differently to this defeat. Both were hidden in the woods and ravines around Batoche. Riel withdrew into the woods to pray. 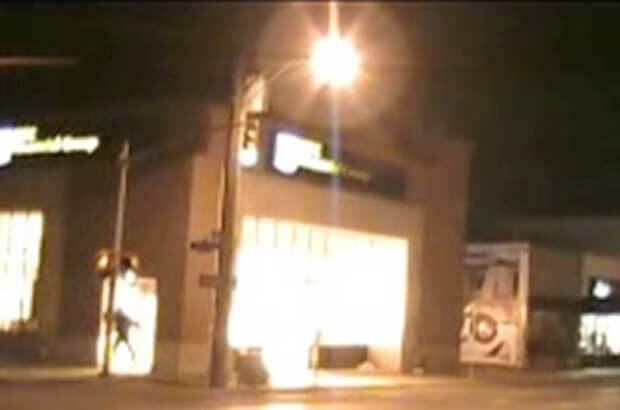 He made no attempt to flee. When Middleton demanded that he surrender, he replied that he would give himself up to fulfill God's will and that he wanted freedom for all his council and his people. He would surrender so that he could continue to defend the Métis cause. Riel's destiny was to be played out in a trial in Regina. The resistance was nearly over. Poundmaker surrendered on May 23, but Big Bear was still at large. He was attempting to restore the military unity of Metis and First Nations which had existed on the plains. By the time that Big Bear's people reached Loon Lake, some camped there while others, including their prisoners went on. Shortly after this Colonel Strange's soldiers caught up with them and attacked the camp. Five Cree warriors were killed. This was the last of the fighting in the Northwest Rebellion. With his forces dying of hunger and no more ammunition left, Big Bear finally gave himself up on July 2. Louis David Riel was executed by the Government of Canada in Regina on November 16, 1885. The execution of Riel and other Métis and Indian participants continues to be controversial in modern day Canada. It has entrenched negative attitudes toward not only Métis people, but all of Canada's Aboriginal people. As well it further exacerbated the widening rift between English and French Canadians. Saskatchewan's Premier, Brad Wall has a bad habit of yammering on and on about how much better things are in the province under a Saskatchewan Party government compared to the former New Democratic government. He spouts this line endlessly without giving any actual facts or figures. Hon. Mr. Lingenfelter (NDP Opposition Leader): -I want to ask a very specific question to the Premier. Can he tell me how many oil wells were drilled in the province in 2007, and how many were drilled in 2009 . . .
Hon. Mr. Wall: — Mr. Chair, the answer to the member‟s question: in 2007, 2,297 oil wells drilled — this is the information I‟ve just been provided — 2,297 oil wells drilled, ‟07; 2,824, ‟08; down significantly in ‟09, 1,610 oil wells drilled. The Chair: — I recognize the Leader of the Opposition. The Chair: — I recognize the Premier. Hon. Mr. Wall: — Mr. Chairman, when we deal with facts, when we deal with facts, the number of oil wells drilled increased significantly in the first year of our government. And then, and then when the biggest recession to hit the world hit the world in 2009, when the price of oil for a while touched into the 40‟s, West Texas Intermediate, when drilling was back across the country, was decreased across our country and around the world, yes the numbers went down, Mr. Chairman. So I‟m not sure what Sherlock‟s discovered by that, but I‟ll be interested in the next question. The Chair: — I recognize the Leader of the Official Opposition. Mr. Lingenfelter: — What a lot of people are curious about is that you don‟t tell complete answers. You talk about things getting much better, but when it comes to natural gas, can the Premier tell me what, the number of gas wells drilled in ‟07 when Lorne Calvert was the Premier, and in 2009? What were the numbers then? Hon. Mr. Wall: — Mr. Chairman, similar, similar numbers frankly: 1,156, Mr. Chairman, in 2007 increasing to 1,221 in the first year of our government. And then when the price fell out of gas — something the member should know about — when the price fell out of natural gas, down to 233 is the forecast when we close out the numbers for 2009. Mr. Lingenfelter: — Mr. Speaker, the reason the public is interested in these numbers is because they hear you talking about how everything has gotten better under your management. And they hear . . . [inaudible interjection] . . . well if you can spin that, if you cheer that, here‟s what the members are cheering about. The number of gas wells drilled in 2007 was 1,217, and they cheer about the fact that it‟s gone down to 330. And they all cheer for that. "The Saskatchewan Party Government Has Become Its Own Worst Enemy"
"The Saskatchewan Party government has become its own worst enemy. The air of confidence that ushered in the young government just 30 months ago has turned to one of arrogance, contempt and superiority. The end result is the almost regular beating the Wall government takes in the newspaper. In his May 5, 2010, column, the Leader-Post’s Murray Mandryk unloaded on Health Minister Don McMorris and the Wall government’s behaviour over its decision to allow hospital foundations to send fundraising letters to former patients. At issue is McMorris misleading the legislature on April 12, 2010, saying that he had consulted with the privacy commissioner four different times on the new legislation when it turns out he hadn’t. Here is a snapshot of the words Mandryk used in describing the major players and their actions: “dishonest” “refuse to listen” “mislead the public” “alarming” “narrow-minded” “obstreperous” “insular” “out-of-touch” “dishonest” “deception” “arrogance” “lying to the house” “unbelievable” “misleading the people of Saskatchewan” “defending the indefensible” “didn’t consult” “misled citizens” and “creating a bogus argument.” [Premier needs to take stock (StarPhoenix, May 5, 2010)]On May 8, 2010, Mandryk took aim at Advanced Education, Employment and Labour Minister Rob Norris, who has been engaged in a non-war stop with labour almost since the day he was sworn in on November 21, 2007. Norris’s latest attack on working people is with Bill 80 – the government’s controversial and unwarranted legislation affecting the construction industry. According to Mandryk, Norris had recently met with Terry Parker, the business manager for the Saskatchewan Provincial Building and Construction Trades Council, and confronted him over an encounter Premier Brad Wall had had with angry Building Trades Council members when he and his family were checking into a Regina hotel for the Saskatchewan Party’s convention in March. “Suffice to say, things didn’t go well,” Mandryk said. And then there’s the premier himself spinning a web of deception and hypocrisy over the government’s recent signing of the New West Partnership agreement with Alberta and British Columbia. Wall is certainly not doing himself or his government any favours by associating with seemingly extreme and nasty people, either. Tom MacNeill is the founder, president and CEO of 49 North Resources Inc., a Saskatoon-based, Saskatchewan focused investment company with strategic operations in financial, managerial advisory and merchant banking. The company provides diversified exposure to oil & gas, potash, uranium, diamonds, coal, base & precious metals, and rare earth elements. 49 North is a supporter of the Saskatchewan Party. Since 2008, the company has donated $2,092 to the political party. Tom’s brother, Ken MacNeill, is the president and CEO of Shore Gold Inc., and is a former member of the Enterprise Saskatchewan Minerals Sector Team. MacNeill abhors socialism. That message comes through loud and clear on the 49 North website. “Although the Province’s population is relatively conservative by nature, polarization between left and right factions in urban and rural areas respectively, has often led to election results that run counter to the generally centrist popular sentiment. In fact, the left wing New Democratic Party and its predecessor, Co-operative Commonwealth Federation, have held the seat of power approximately 75% of the time since World War II with the right wing Conservatives 16% and Liberals 9%,” the website states. This seems like an odd way to promote a company to potential investors – denigrate and insult half the people living in the province where your business is headquartered. The last conservative government in Saskatchewan left the province in ruins. The Encyclopedia of Saskatchewan notes that the Grant Devine Tory’s ran consecutive deficit budgets, accumulating a debt of over $1.5 billion its first four years in office. The PCs ran up a deficit of over $1.2 billion in 1986–87, a far cry from the deficit figure of $389 million that had been presented in the 1986 pre-election budget. The fiscal crisis led to cutbacks in services, cancellation of programs, and firing of employees, the encyclopedia states. By the end of the 1980s it was running a surplus on operating expenses excluding debt charges, but interest payments drove the province deeper into debt each year. By 1991–92 the accumulated debt was over $15 billion, and annual interest payments exceeded $500 million, the third-largest item in the budget after health and education. This is the world that Premier Brad Wall, who served as a ministerial assistant in the final years of Grant Devine’s Tory government, grew up in but the 49 North website acknowledges none of it. The 2010 Saskatchewan Investment Conference held May 6-7, 2010, at the Saskatoon Inn Hotel and Conference Centre was sponsored by 49 North. Organized by Vancouver-based investor conference specialists Cambridge House International, the two day event focused on investment opportunities in energy and agriculture in Saskatchewan. Attending the conference were over 10 market resource analysts participating in panels, workshops and keynote presentations, and over 40 public companies representing the world’s top mineral exploration and development management teams. Among the exhibitors was Enterprise Saskatchewan. The agenda for May 6 included a luncheon Q & A and panel discussion with Saskatchewan Energy and Resources Minister Bill Boyd. The dinner itinerary featured Premier Brad Wall fielding questions from a panel of industry analysts. Earlier in the day, MacNeill gave a corporate presentation entitled Saskatchewan Politics and Economics… Why Growth Was Stunted. It showed that Saskatchewan’s resource industry supplies one third of the world’s potash and one quarter of the world’s uranium. It’s also the second largest oil, third largest natural gas, and third largest coal producing province in the country. Saskatchewan has significant oil sands potential and has the world’s largest diamond bearing kimberlite field. MacNeill’s presentation went on to compare the post-World War II differences in development between Saskatchewan and Alberta, slamming the supposed evils of socialism, things like Crown corporations, higher taxes, government oversight, and focusing on jobs not wealth creation. Covering the event were StarPhoenix reporters Jeremy Warren and Jeanette Stewart who said MacNeill told the crowd that socialists are good for one thing. “The one thing socialists are good at is building things: Power lines, roads, infrastructure,” MacNeill said. But socialism’s positive contribution to society stops where the pavement ends because the political and economic philosophy has impeded the growth of Saskatchewan’s natural resource sector, MacNeill said. Socialism killed private investment in Saskatchewan’s mining and oil and gas industries, he said. MacNeill would like to see 10 times more mines operating in Saskatchewan, but the province has to first shed its socialist past, he said. After six decades, Saskatchewan’s resource sector is poised to catch up with the rest of Canada, MacNeill said. Wall Street was only too happy to accept a bailout of $700-billion in public funds when socialism came to its rescue in late-2008. Never mind that taxes help build the schools, libraries, swimming pools, sports fields, local hockey arenas, museums, affordable housing, playgrounds, community centres, roads, transit, hospitals, and public parks that residents hold dear. Never mind that “government oversight” protects peoples’ rights, culture, health, the environment, and help provide better wages, working conditions, worker safety, and a decent standard of living. For people on the far right like MacNeill, the idea of the public good is way down on the list of priorities, which always begins with profit and wealth. It’s a survival of the fittest mentality driven by greed with little social responsibility or being a good corporate citizen. The scary thing is the Wall government embraced the conference with fervor sending two of its biggest names along with its flagship economic development agency as an exhibitor. Canadian Cynic's prediction of Nov 7, 2007 turns out to have been prophetic! "REGINA — In a scenario not seen at the Saskatchewan legislature in nearly three decades, the speaker of the assembly ruled Tuesday that there was enough evidence to suggest Health Minister Don McMorris misled the assembly to require a debate by MLAs. [...] McMorris said in question period on April 12 that Information and Privacy Commissioner Gary Dickson was formally consulted "four different times on this very regulation." However, he clarified to reporters on Monday that three formal consultations took place, and they occurred between 2004 and 2007 under the previous NDP government when a similar change was contemplated." I think that Saskatchewan's Health Minister, Don McMorris is a pretty good guy. I think that he is trying to do the best that he can with the resources that he has available to him. This week's ruling by the Speaker and the subsequent debate by the Legislature ended with an apology by McMorris for misleading the House. The key here is simple. As the Minister, he has to balance his heavy workload with huge public expectations. He, more than any other minister, deals with real life and death issues. He oversees the largest department of the provincial government and has already aged a fair bit during his tenure as health minister. My advice to him is simple. Do not assume - do not take short cuts - do not adopt a flippant attitude in your work. Take time to boil things down to essentials. Mr. McMorris, you have what I consider to be the most important job in the Cabinet because the health, in fact, the very lives of Saskatchewan citizens rests in your portfolio. Surrounded, as you are by the lunatic fringe of your particular political party is, no doubt, a factor in your overall balancing act. Do what is right for the people of Saskatchewan. Don't listen to the nutbars in your Caucus who look at everything through the tint of their political glasses. I believe completely, that you wanted to stand and deal with this matter immediately, but those who control the 'politics' in your caucus decided to do it their way. The Saskatchewan Legislative Assembly unanimously passed an Opposition Motion today, asking CSIS to open their file on former Saskatchewan Premier, Tommy Douglas. To date, officials from CSIS have refused to release the information, citing 'national security' issues. BS! I think they are more worried about 'national embarrassment' issues for certain, still living, Canadian politicians. First, even though the Motion did pass in the Legislature, certain far-Right leaning Members of the Saskatchewan Party Caucus boycotted the vote. These included former Conservative Party Leader, Bill Boyd, former Conservative MP Jeremy Harrison and Premier Brad Wall as well as Cabinet Ministers Nancy Heppner and Ken Cheveldayoff, and Yogi Huyghebaert. All six remained away from the Chamber during the historic vote. Secondly, at the same time that the vote occurred, a Historical Plaque commemorating the 50th anniversary of the first election of Tommy Douglas's 5 term government in 1944 was quietly removed from the rotunda of the Legislative Building! I have to wonder if the removal of the historical marker was not done as a sop to the extreme Right wing of the Saskatchewan Party? RCMP Called In To Investigate Huge Alberta Mortgage Fraud - Conservative MP involved? The Bank of Montreal has initiated civil suits against hundreds of individuals in what they are calling a massive mortgage fraud case in Alberta. The civil suits are intended to recover millions of dollars lost in a scheme that seems to have been a well organized conspiracy to massively inflate property values prior to mortgage applications. It now appears that the Royal Canadian Mounted Police are also investigating to see whether criminal charges will be laid. CBC is reporting that Calgary Conservative Member of Parliament, Devinder Shory is being sued by the Bank of Montreal for his alleged involvement in the case. "If you ever needed an example of just about everything that's wrong with Premier Brad Wall's Saskatchewan Party government, look no further than its decision to allow hospital foundations to send fundraising letters to former hospital patients -- and its increasingly dishonest explanation to justify it. It's all a little sad. It's actually the government's good Samaritan-nature that been the driving force behind a desire to help a truly worthy cause. But the ease with which this relatively young Sask. Party government can ignore the privacy aspect of a debate, refuse to listen to that other side of the debate, bull ahead with its policy and then mislead the public on the facts in debate is downright alarming. It's far too early in the Sask. Party government's tenure to be this narrow-minded in assessing public policy, this obstreperous, this insular, this out-of-touch, and, frankly, this deceitful. This level of deception and downright arrogance is usually reserved for older governments about to be thrown out on their butts. It's time for Wall to take serious stock." For the first time in decades, the Saskatchewan Legislative Assembly is dealing with what the Speaker has ruled is a 'Prima Facie' breach of Privilege by Saskatchewan's Health Minister for telling the Official Opposition that he had consulted with the Privacy Commissioner on 4 separate occasions. The Privacy Commissioner recently wrote to all MLA's and advised that no such consultations had occurred. "The NDP is alleging that Health Minister Don McMorris misled the public when he said the province's privacy watchdog was consulted about a controversial new plan to provide fundraising hospital foundations with the names of former patients. But McMorris said that when he spoke of formal consultations, he was referring to the ones that took place between the health ministry and Information and Privacy Commissioner Gary Dickson between 2004 to 2007 under the previous NDP government. McMorris said there was no need to seek Dickson's formal opinion again this year when the Saskatchewan Party government decided to proceed with the change to health privacy rules, because his opposition to the idea had already been made clear." On May 4th, 1970 at Kent State University in Ohio, students protesting the escalation of the War in Vietnam into Cambodia by the Republican Nixon administration, were gunned down by members of the National Guard. The shootings led to protests on college campuses throughout the nation, and a student strike - causing over 450 university campuses across the United States and Canada to close with both violent and non-violent demonstrations. A common sentiment was expressed by students at New York University with a banner hung out of a window which read "They Can't Kill Us All." Just five days after the shootings, 100,000 people demonstrated in Washington, D.C. against the war and the murder of student protesters. Ray Price, Nixon's chief speechwriter from 1969-74 recalled the Washington demonstrations saying, "The city was an armed camp. The mobs were smashing windows, slashing tires, dragging parked cars into intersections, even throwing bed springs off overpasses into the traffic down below. President Richard Nixon was taken to Camp David for two days for his own protection and safety. Charles Colson (Counsel to President Nixon from 1969 to 1973) stated that the military had to be called up to protect the nations's administration from the angry students. We Remember Kent State and those who fight against 'war culture'! More Photos of Kent State on May 4th, 1970. New West Partnership Agreement Is Flawed Flawed Flawed! On Friday evening, I was in Kingston listening to a speech by western Canada’s best Premier. The following morning, I awoke to discover a far less coherent op-ed by the other three western Premiers on The Globe and Mail’s website. They were trumpeting Friday’s unveiling of the New West Partnership. As the Saskatchewan Federation of Labour and the Jurist have already pointed out, this arrangement is a backdoor for Saskatchewan to join Alberta and BC in the Trade, Investment and Labour Mobility Agreement (TILMA). Saskatchewan had rejected TILMA because it empowers business to directly challenge a broad range of public policy, without identifying or solving actual problems. In addition to implementing that flawed model, the New West Partnership also hoses Saskatchewan in several specific respects. One has to love the term “New West.” Social democrats live in fear of being accused of advocating 1970s-style policies. However, conservatives have no shame about reviving slogans of the same vintage. The New West Partnership includes some apparently positive elements: combining procurement orders to lower costs through increased buying power, collaboration on research and development, and joint international trade missions. But there is no obligation to coordinate in these areas. Certainly, the three westernmost provinces did not need a “New West Partnership” to work together on procurement, research or international trade, as they have frequently done in the past. Indeed, it presumably makes sense for Saskatchewan, Alberta and BC to also cooperate in these and other areas with the seven provinces that have not signed the New West Partnership. In promoting international trade, the greatest economies of scale could presumably be achieved by Canadians combining our efforts through the federal government. The New West Partnership’s core is the “New West Partnership Trade Agreement” (NWPTA). If you do not want to read the whole thing, check out the five-page backgrounder. There is no quid pro quo: only Saskatchewan has to change its tendering system, regulations and standards. There is no compromise: Saskatchewan must harmonize to the existing Alberta-BC model. The Globe op-ed commits to “break down unnecessary barriers between our provinces,” “interprovincial barrier-free trade,” “removing barriers to trade” and not “allow internal borders to stifle opportunity.” As usual, it does not bother to identify any actual trade barriers. Since Alberta and BC are already in compliance with NWPTA, these unidentified barriers must be in Saskatchewan. However, they have had no apparent effect on internal trade flows. Between 1999 and 2008 (the most recent data available), Saskatchewan’s interprovincial imports rose 70%. By comparison, its international imports rose only 56%. The most recent figures on bilateral trade between particular provinces are for 2006. That year, Saskatchewan bought $1.8 billion more goods and services from Alberta than it sold to Alberta. Also, Saskatchewan bought $419 million more from BC than it sold to BC. So, Saskatchewan’s market is wide open to goods and services from its western neighbours. NWPTA will not affect those trade flows since there are currently no real trade barriers. However, if NWPTA somehow did increase these two-way flows, the result would be a larger interprovincial trade deficit for Saskatchewan. NWPTA’s inclusion of Crown corporations is notable for at least four reasons. First, the Saskatchewan Party cited its intention to continue using Crown procurement to support Saskatchewan industry as a major reason for rejecting TILMA. The Saskatchewan government should at least acknowledge changing its mind on this matter and explain why. Second, other deals that cover provincial procurement, such as the longstanding Agreement on Internal Trade and the recent Canada-US Agreement on Government Procurement, do not apply to Crown corporations. As far as I know, NWPTA will be the first trade deal to restrict procurement by Saskatchewan Crowns. Third, since Saskatchewan has a much wider array of Crown corporations than Alberta and BC, it is committing much more. For example, Alberta and BC businesses will gain a legally-enforceable right to access SaskTel’s procurement. But Saskatchewan businesses will have no parallel right to access procurement by Telus, the main telephone company in Alberta and BC. Fourth, a document unveiled Friday indicates, “NWPTA does not apply to any corporation, partnership, trust or other entity or organization established, owned or controlled by either the Alberta Investment Management Corporation or the British Columbia Investment Management Corporation.” There is no similar exemption for the Crown Investments Corporation of Saskatchewan (or any part of it). The usual objection to “free trade” in procurement is that governments may legitimately want to use procurement to pursue social goals other than minimizing cost. However, even if monetary savings are the only goal, one must weigh the potential of more competition to lower prices against the cost of administering an open tendering process. For large purchases, tendering costs are trivial. But for small purchases, these costs could easily outweigh any savings from competitive pricing. Therefore, procurement deals generally only cover purchases worth more than a specified dollar value. TILMA and NWPTA set these thresholds extremely low. For goods purchased by government ministries, the threshold is just $10,000. If it costs $500 to run an open tendering process, that would add 5% to the cost of a $10,000 purchase. Complying with such requirements is also a bureaucratic nightmare. On a recent trip to Edmonton, I met up with a couple of friends who are lawyers and Conservative Party supporters. Both were cursing TILMA. Apparently, complying with it has made public procurement extremely cumbersome and created a huge volume of paperwork for even routine purchases."